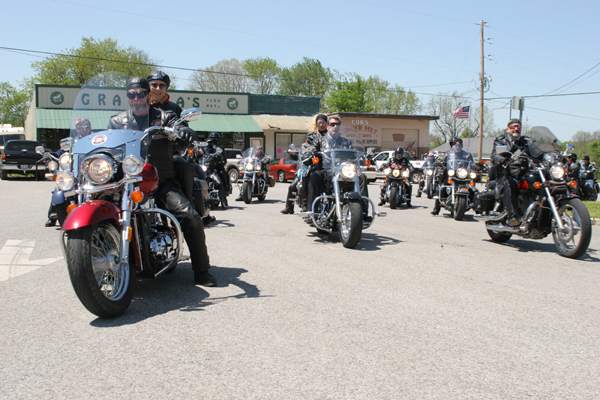 Considering scenery, twisty roads and interesting places, the Heart of the Ozarks ride gives motorcyclists a taste of all the best the Ozarks have to offer. 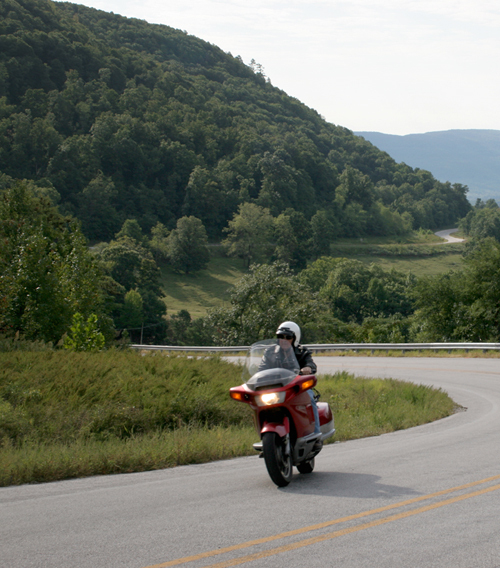 The roads in this part of the Ozarks follow the contours of the ridges and creeks that shaped the region. 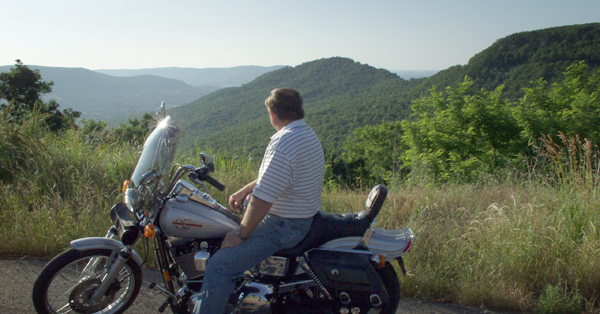 So, to experience a great overview of the Ozarks, you've just got to try this ride. Use the Cruise the Ozarks planning map and make your way to the intersection of US 412 and Ark. 21, about 30 miles east of Fayetteville. 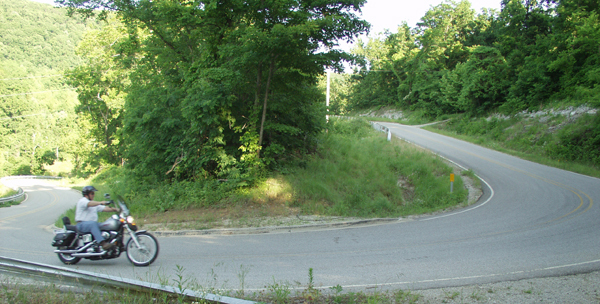 Take 21 south to Kingston and your Heart of the Ozarks ride takes off. Follow 21 out of Kingston to the Boxley Valley. Turn left on Ark. 43 at the junction of 43 & 21. This will take you to Ponca. From Ponca take Ark. 74 to Jasper. At Ark. 7, head south to Ark.374. This will take you down into a beautiful valley. 374 intersects Ark. 123. Take 123 south through Mt. Judea. Stay on 123 to Ark. 292 near Clarksville. 292 will take you back to Ark. 21, which you can take north back through the Boxley Valley and Kingston. 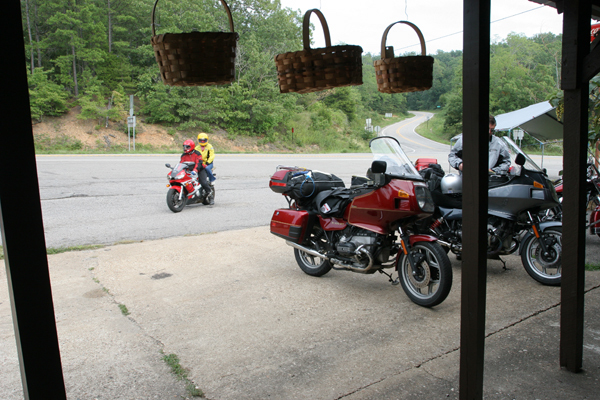 Kingston, the center picture above, is a great meeting place for riders to assemble for their ride. 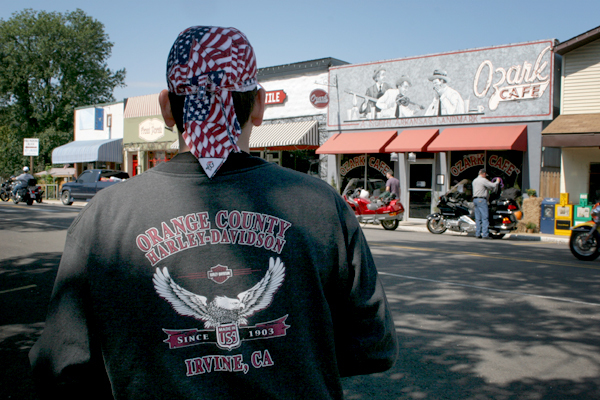 There's a cafe, antique/flea market, and convenience store to hang around until you leave. Remember President Clinton? And his White Water Development problems involving the Madison Gurantee Bank and Trust? The name has changed on the front, but the bank is still there. Interesting how such a little, bitty bank caused such big trouble for a U.S. President. Picture on the right above, Jasper, a real gem in the Ozarks. Left, the ride from 21/43 through the Boxley Valley is gorgeous. Elk have been reintroduced to the area, so be watchful. 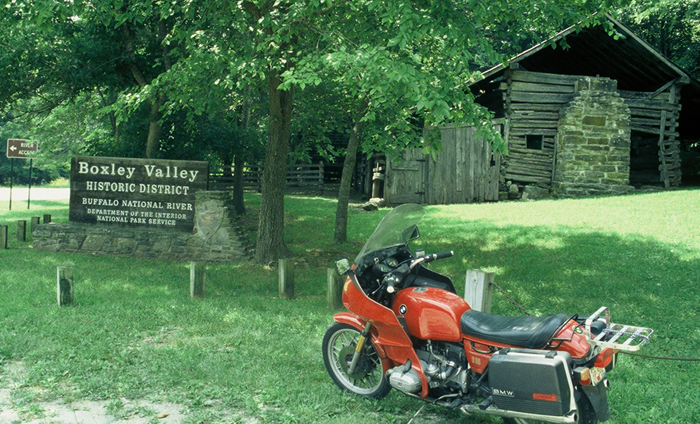 The valley provides the path for the upper Buffalo River, the first national river established by the U.S. Congress in the late 1960s. 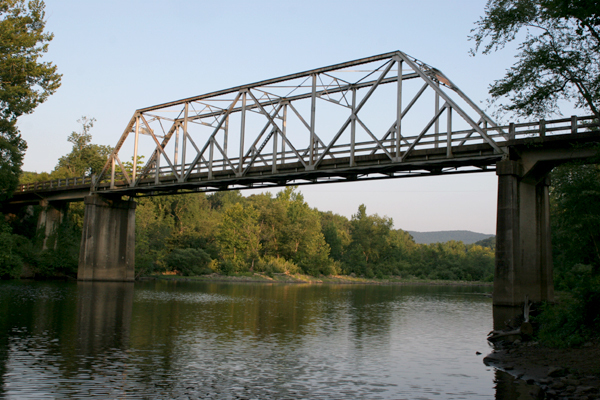 It's a great float stream and if you want to get off your bike for a canoe trip, check out any of the float services, including the one in Ponca at the north end of the Boxley Valley. 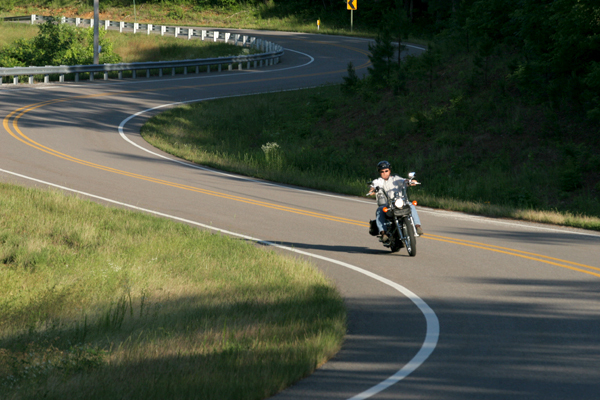 When you reach the the 292/21 junction and head back up north on 21, you will be closing the circle of the Heart of the Ozarks loop. Ark. 21 desends down into the Boxley Valley. You will ride the section of the beautiful valley and close the loop at the junction of 21/43. There are places to stay or camp along the way and great little local cafes. But consider packing a sack lunch and stopping at one of the many fine places to pull off and have a picnic lunch.